A few short years ago, Shirley Phillips-Black felt her weight was holding her back. “I couldn’t do anything,” Shirley recalled. Injuries to her knees made it difficult to do even simple tasks, like walking through a grocery store, and anxiety about fitting in seats kept her from traveling by plane or riding on roller coasters – a favorite pastime. Afraid she wouldn’t be able to buy new clothes she liked in her size, she carefully mended her old size 26 clothes again and again. Today Shirley, 55, a complex rehab coordinator with Memorial Home Services, is enjoying the freedom of living 100 pounds lighter. She lost the weight with the help of the Memorial Weight Loss & Wellness Center – a journey that required plenty of hard work and determination along the way, and that awakened a new sense of confidence. At the time, Shirley – who now works as a complex rehab coordinator with Memorial Home Services – was skeptical. She had trained for a career in law enforcement and had always enjoyed an active lifestyle. But over the decades, the side effects of medication, stress and changes to that lifestyle began to take their toll. Shirley was first referred to Memorial Weight Loss & Wellness by Nicole Florence, MD. Both of her knees needed to be replaced, and she hoped to have both procedures done at the same time. But she would not qualify for surgery without losing weight first. At that time, the Weight Loss & Wellness program was in its infancy. As Shirley attended her first support group meetings, her goal was to achieve a body mass index under 40 – a threshold that would allow her to have her knees replaced. She reached that goal in five months by carefully following the program’s guidelines for diet and exercise. Her fellow support group members provided fellowship, camaraderie and inspiration. And before going in for surgery, she had another special milestone to celebrate: going to Six Flags and riding the Batman roller coaster with her family. She was back on the job following her double knee replacement within six weeks, but her weight loss plateaued after her surgeries. She didn’t gain the weight back, but she wasn’t losing any longer. Then, in the summer of 2017, Dr. Florence brought up the possibility of bariatric surgery. Shirley had already survived multiple bouts with breast cancer, and Dr. Florence told her that her weight put her at risk of developing the disease again. In January 2018, she underwent roux en y gastric bypass, a procedure in which a small pouch is created from the stomach and connected directly to the small intestine. This reduces the amount of food the patient can eat, while also reducing the absorption of fat and calories. Candidates for this type of surgery undergo extensive preparation through the Memorial Weight Loss & Wellness surgical weight loss program, including nutrition and lifestyle counseling to ensure they’re able to sustain these positive changes after the procedure. For Shirley, this meant continuing to do what she’d been doing since the beginning: carefully following the team’s instructions and remaining committed to making healthy choices. “It was just another evolution of the process,” she said. 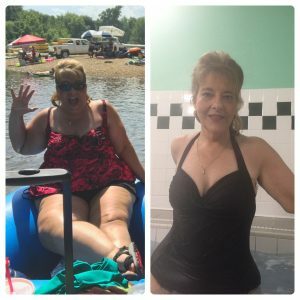 Since her conversation with Dr. Florence in July 2017, Shirley has lost more than 100 pounds. Now, she enjoys shopping for clothes in her new dress size – 10 — and is looking forward to all the possibilities that are now open to her. But not all the changes she’s experienced over the past few years have been physical. During that time she weathered some major changes in her personal life, including a divorce, without letting her circumstances affect her commitment to improving her health. Shirley credits the experience with helping her feel more confident and independent – a frame of mind she feels is essential to her successful weight loss. “I think this process has helped me discover that you have to be responsible for your own happiness,” she said.